If you follow the NBA, then you probably know that the future of the Dallas Mavericks lies with their talented rookie, Luka Doncic. 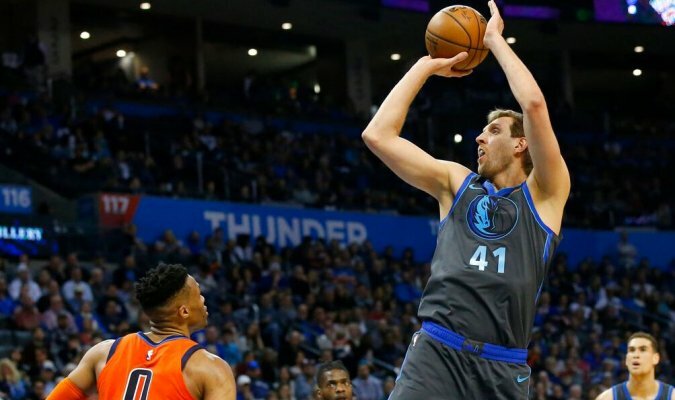 With Doncic out for Sunday’s game against Oklahoma City with an injury, there wasn’t much of a reason to believe the Mavericks were going to give the Thunder much of a challenge. But they did—and then some. The Mavericks got off to a strong start and took a seven-point lead after the first, 31-24. Oklahoma City cut the lead to two quickly in the second but were unable to close the gap. Dallas was able to push the lead out to 13 following a Jalen Brunson layup with 4:36 left in the quarter. However, the Thunder were able to narrow the gap down to two, 58-56, by the end of the half. Dallas extended the lead out to six early in the third. However, the Thunder were able to close the gap and pull ahead, 64-62, following a Steven Adams basket with 7:26 to play in the quarter. But by the end of the quarter, the Mavericks were back in front, 80-75. A competitive fourth quarter saw the Mavericks lead by as much as nine. But with a 26-foot three-pointer by Paul George with a little over a minute to go, the Thunder pulled ahead by one, 101-100. Jalen Brunson retook the lead moments later followed by Jeremi Grant doing the same with 32.8 seconds to play. But then Dwight Powell followed that play up with a dunk to give Dallas the lead for good. Ryan Broekhoff added a pair of free throws to make the final 106-103, Mavericks. Burke led the Mavericks with 25 points and eight assists off the bench followed by Jalen Brunson with 18 and Devin Harris with 15. Dirk Nowitzki chipped in seven points and 13 rebounds. Oklahoma City was hoping to bounce back from Friday’s loss to Denver with a win but struggled to make a shot throughout the game. They were 38-98 (38.8 percent) from the floor and just 11 of 43 (25.6 percent) from three-point range. Paul George led the way for the Thunder with 27 points and 11 rebounds. Russell Westbrook recorded a triple-double with 25 points, 11 rebounds, and 11 assists, and Steven Adams chipped in 20. Oklahoma City will try to get back on the right side of the scoreboard when the team hosts the Los Angeles Lakers Tuesday night. Dallas will go for win No. 31 when they host the Philadelphia 76ers Monday night.